Nowadays, you can work or study almost anywhere with a laptop. You might be a student and need a laptop for class; to make projects, to design models using software or to use word processing software. A laptop is also an indispensable device for workers on the go. Anywhere you are you can see people using laptops in cafes, libraries and even in parks. And what better way to carry a laptop than to use a laptop backpack? Gone are the days when you need to use a bulky laptop sling bag. This type of bag can strain your shoulders and back plus will only be in the way as you commute. A laptop backpack lets you carry your laptop safely and efficiently. You can move quickly without banging your laptop everywhere. There are new laptop backpacks with improved designs such as a waterproof laptop backpack. 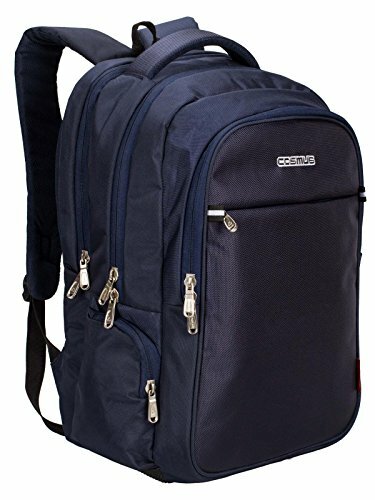 A waterproof laptop backpack is very popular in India, given that a lot of places get a decent amount of rainfall for several months. These waterproof laptop backpacks are made from a very strong material which can resist everyday wear and tear. These bags have enough compartments for stuff you need to take with you. It has spaces for pens, small books, laptop chargers, cables and more. And because this is a waterproof laptop bag, it will protect your laptop against splashes and drips. In this article, I have covered seven best waterproof laptop backpacks in India that you can buy online. Find the one that will suit your needs. In case you’re in a hurry, here are my top three recommendations for the best waterproof laptop backpacks. Still confused about which waterproof laptop backpacks is best for you? 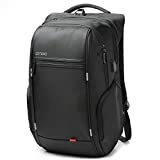 Let me help by providing detailed reviews on the best waterproof laptop backpacks that I found in the market (and the ones you can buy online). 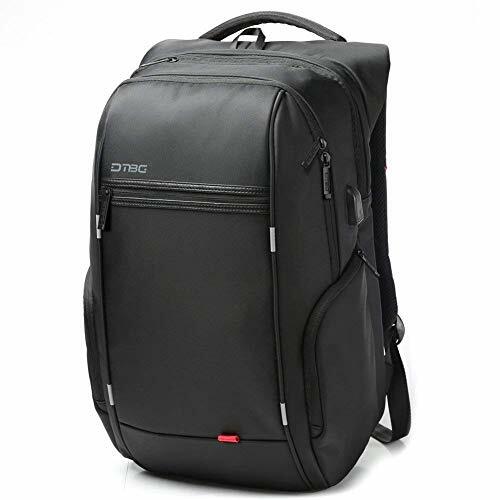 These reviews will definitely help you gain awareness and understanding of the best features, pros, and cons of each waterproof laptop backpack. Below is the table that shows all the waterproof laptop backpacks covered in this review. Now let’s have a look at the detailed reviews of each of the waterproof laptop backpacks covered in this article. 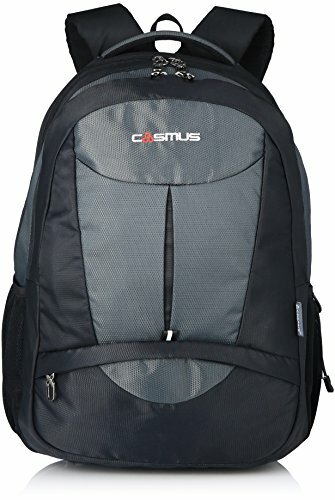 If you have a large laptop, possibly with a 12” screen or larger, then this Cosmus Atomic Dx 3 waterproof laptop backpack is for you. This is a backpack that comes with three compartments. Aside from storing your laptop safely and securely as you travel, this bag is large enough to hold other items like books, pens, laptop accessories, a power bank and more. This also comes with a large front pocket where you can store smaller items like pens, money, cards and your phone. It is waterproof because of its PU coated water resistant outer fabric. It is made of a combination 1680D and 1000D fabric so you can guarantee that it’s durable as well as waterproof. It has large zippers that can hold padlocks and small locks to secure the bag’s contents. It also comes with a free rain cover to add more waterproofing protection for your bag. This is found in the bottom zippered pocket. And this waterproof laptop backpack also gives you more value for your money because it comes with a 1-year product warranty against manufacturing defects. Other features include a felt-lined tablet pocket and organizer pocket, a water bottle holder and two-sided zipper pockets. These will let you carry more stuff anywhere you go. And finally, the straps are well-padded so your shoulders and backstay protected despite carrying a heavy and full backpack. You can travel with your laptop and all other accessories safely and efficiently with the Killer Louis waterproof laptop backpack. This backpack also comes with three major compartments so you can store more stuff to carry anywhere. The three compartments can store your laptop, tablet, books, school stuff, and work accessories. Its easy access front pocket comes with an organizer for pens, markers and small tools plus a mesh side pocket for storing money, train cards and so on. This backpack is made from only durable materials. The outer fabric is made from PU-coated polyester fabric while the inner fabric is made from strong PU-coated polyester fabric. This lets the back remain in tip-top condition for years and provides a waterproof shield for the backpack’s contents. The laptop compartment is big and can hold up to 15.6” laptop. It is also well-cushioned so you can protect your device from falls and sudden movements. 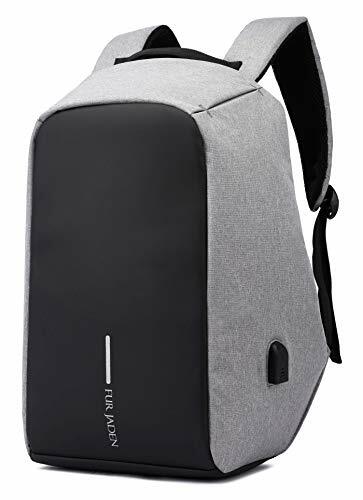 You will also love this Killer Louis backpack because it gives you a lot of value for your money with its one year warranty against any manufacturing defects. The DTBG waterproof laptop backpack has some unique features that will surely catch your attention. This bag comes with a USB 2.0 charging port that extends at the right side of the backpack. This connects to a power source which will let you charge your device anywhere you are. It is water resistant therefore your laptop, as well as other items, remain dry inside the bag. It has a dual-zippered access to improve bag security plus a thick soft foam padding at the back to ensure comfort even if you commute with the bag on for longer hours. The main compartment of the DTBG backpack is roomy and can fit books, clothes and other accessories for your laptop. It also comes with a water bottle holder and umbrella holder along its sides. The zippers are anti-theft because of its hidden design. It could be hard to find where the zippers are because you need to hold the sides of the back to find these. The material is strong and allows airflow. It has a handle on top so you can hand carry your bag for short trips. You can also use this on trolleys with its additional adjustable straps. It comes with a 2-year global warranty that gives you more value for your money. Some people have complained about the anti-theft zippers being hard to find (but that’s because it’s anti-theft too). It’s hard to find where the zippers are in this laptop backpack right? This is actually Fur Jaden’s anti-theft feature. You can protect your stuff especially your laptop and money inside the backpack because it is very difficult for a thief to open it. This is a large-capacity laptop that can carry your laptop as well as other accessories and personal items. It may have only one compartment but it is spacious and capable of carrying more stuff. It also has easy access pockets on its straps to store important items like train cards. The large compartment comes with multiple pockets for different accessories. This comes with additional anti-theft pockets at the back for added security. It also lets you charge on the go with its charging dock at the side of the back. You can connect this on a power bank and charge your phone or tablet as you move along. This comes in gray color and is perfect to take to school or to work. Store your laptop inside this waterproof backpack and forget about it. The Kossh Anti-Theft Waterproof Casual Backpack will let you carry your valuables bravely even in busy streets and crowded trains. It has anti-theft features and is waterproof and cut proof because it is made from 300D waterproof fabric and high-quality polyester. The zippers are completely hidden from view, therefore, it would be impossible for a thief to get through the bag. This is a large-capacity laptop that gives you 30 liters of separate space for your laptop, iPads, notebooks, wallet, keys, power bank and more. You can even carry a day’s number of clothes and other personal items inside this bag. You can use this for school, work or for travel because of its spacious and efficient design. It also comes with a convenient USB charging port which can connect to your power bank. You can charge your devices on the go with this bag. And of course, it has a lightweight and ergonomic design with breathable shoulder straps, sponge padded cushions at the back and more. Store your laptop and everything else inside this 3-compartment waterproof laptop backpack. 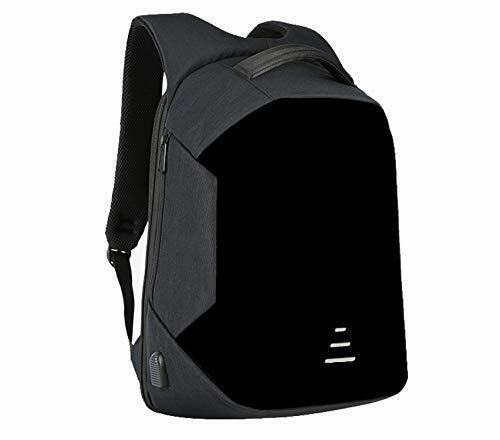 The Cosmus Eden backpack has large compartments for your laptop, accessories and other personal items. It has two front zippered pockets and meshes pockets to store more stuff. You can take it anywhere and feel secure because of its well-padded compartments that can hold up to 15.6” laptop size. It can be a good bag to take to school and to the office if you commute daily. It also has a one-year warranty against manufacturing defects which gives you more value for your money. 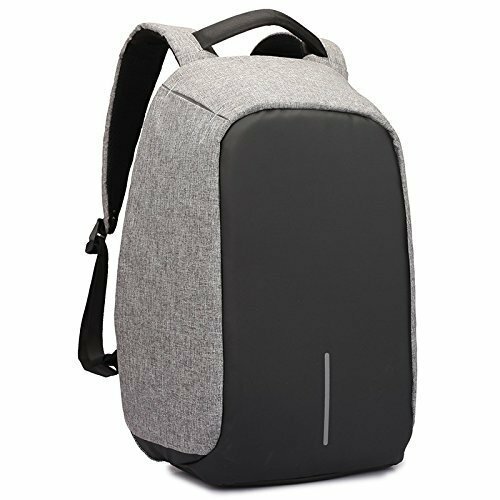 The Rewy AT-1556 backpack has anti-theft features so you can safely travel with your device anywhere. It has a convenient USB charging port that can be connected to your power bank to charge your devices on the go. It is made from durable fabric that is waterproof and very easy to clean. It has an elastic belt so you can wear this backpack safely minus any strain on your back and shoulders. It also comes with night safety reflectors so you can wear this safely at night as well. This is made from 600D fabric with a 6mm anti-collision sponge layer which keeps all the bag’s contents safe and secure. It has multiple compartments so you can stay organized as you travel, at work or in school. There is a number of amazing laptop backpacks in the market but only a few are completely waterproof. You must choose well and check out all the other backpack features as well. You may also be looking for anti-theft features, multiple compartments, padded compartments, multiple pockets and USB charging port features overall because all of these enhance the way you use your backpack. Overall, choose the waterproof laptop backpack that’s right for your everyday work and travel needs. 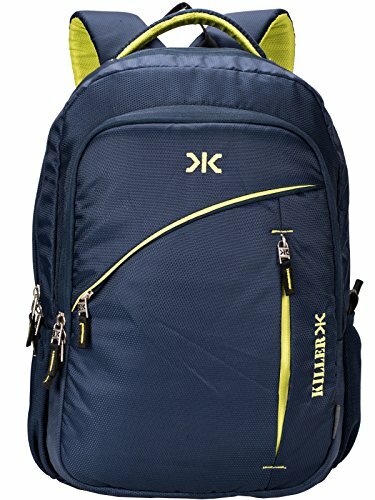 Best Backpack Brands in India (Trekking, Casual, Laptop). Best Camera Backpack in India (for trekking and hiking).